Notes: Details via Megalithic Portal. Notes: The Langstone standing stone and also the stone circle were used for target practice by American troops who were stationed nearby during the Second World War. 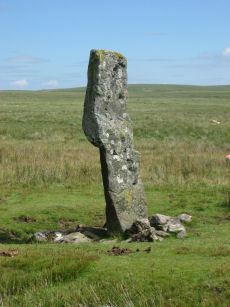 Bullet holes can be seen on the Langstone standing stone and the circle was sadly smashed to smithereens. 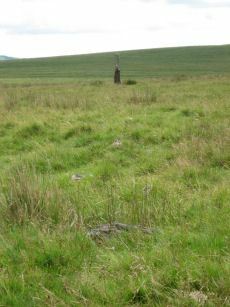 The Langstone Moor Stone circle had been restored in 1894 when all of the stones were re-erected in their original socket holes. Today only 3 stones remain intact with 10 having been destroyed and the rest overturned during World War Two. The debris of the former stones remain in place. Pre-war photos give a sense of how spectacular this site used to be. The original restored circle consisted of 16 stones in a 20.9m circle. 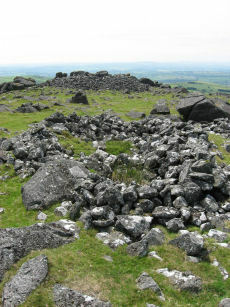 The original survey by the Dartmoor Exploration Committee suggested that there might have originally been a secondary concentric circle consisting of elvan rather than granite stones although the evidence for this today is unclear (see Extract from the Second Report of the D.E.C. ), see also HER MDV4226. 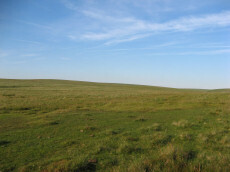 Further coverage can be found on Legendary Dartmoor: Dartmoor's Prehistoric Langstone Moor. Lethbridge p14, diagram p13. Notes: Turner A22. 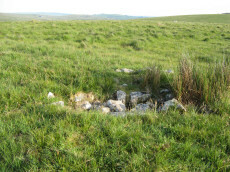 "A semi-circular bank, possibly the remains of a ring cairn.1.4 to 2m wide, 0.4m high. Composed of small + medium sized stones now largely turf-covered. It fades at each end of a near-perfect semi-circle of 14.9m internal diam. There is a low stone pile, 0.2m high, in se quadrant". The author visited this site on 26/06/2018. 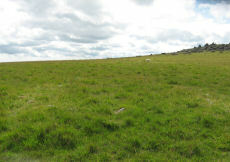 A semi circular group of mounds can indeed be seen but these mounds are like the mounds all over Cox Tor, White Tor and Roos Tor. These mounds are probably periglacial. An alternative explanation of these mounds is the activity of the yellow meadow ant (Lasius flavus). Whilst the ants can use stones (natural or ring cairn) to initiate their mounds they are not required. Whichever explanation for these mounds is correct it seems most likely this site is a natural occurrence that happens to look like a ring cairn. Notes: Butler Langstone Moor 2 - Vol. 2. Map 30.10. 129 Grinsell PETER TAVY 39. The cist is now housed in the Plymouth City Museum. 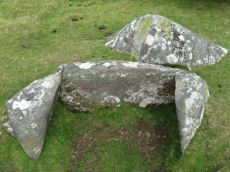 Notes: "Two round barrows on Peter Tavy Great Common. (A) SX54847764 A flat topped stony mound, probably a cairn, about 12m E-W by 11m transversely and of 0.6m maximum height. There is no apparent kerb and the edges are ill-defined. It is predominantly turf-covered but a small area of stones is exposed in the NW quadrant presumably the site of the 1899 excavation. 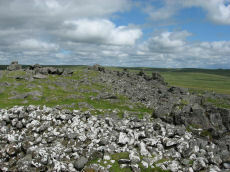 (B) SX54887765 Located 45m ENE of 'A' or probable cairn visible as a turf covered mound about 5m in diameter and 0.3m high. No kerb is evident and the centre has been disturbed. 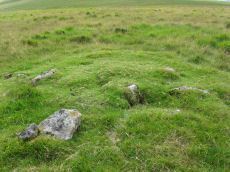 The mounds are both quite prominently situated on the summit of a gently domed ridge of rough grassland which is generally devoid of surface stone."